Air travel is one of the most convenient routes to choose. It’s safe, it’s fast, and it’s comfortable. All major cities in India are well-connected with each other by the air route. And, traveling between them has become a matter of just a few hours. If you are planning to travel from Colombo to Bangkok, then air route is what you should choose. Here’s all the information you need to know. The nearest airport to Colombo is and its IATA code is CMB. The nearest airport here is with an IATA code, BKK. Between Colombo and Bangkok, 9 airlines are operational. In a week, around 110 flights travel from Colombo to Bangkok. The travel duration between these cities in a non-stop flight is usually around 03h 35m. Colombo to Bangkok flights will cost you a minimum of 0. This may extend up to 0. Worry not! As you may enjoy a number of domestic flight booking offers exclusive for Cleartrip customers! Is it true that takes less time on a direct Colombo to Bangkok flight than other airlines? Yes. provide the fastest flights on this route. Will I be served alcohol on a Colombo to Bangkok flight? What is the average range of Economy class tariffs on Colombo to Bangkok flight route? The Economy class airfare ranges from Rs. 0 to Rs. 0. Japan Airlines, translation missing: en.airlines.MJ, SriLankan Airlines, Finnair, Etihad Airways, Myanmar Intl, Thai Airways, Sunstate Airlines, and Asiana Airlines provide tickets in this range. Is there web check-in option available with Colombo to Bangkok flight? Yes, passenger do get a web check-in option with their Colombo to Bangkok flight via online web check-in or airport check-in. 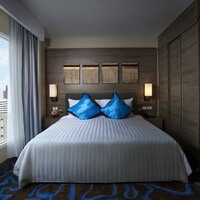 Can I book budget hotels near Bangkok Airport through the Internet? Yes, one can book budget hotels near the airport via Cleartrip hotels option"
Does Colombo Airport have nappy changing facility for babies? Yes, the newly developed Colombo Airport has such facilities for babies and infants.